Quality pneumatic conveying and packaging systems for food ingredients. Magnum Systems has engineered, designed and manufactured quality pneumatic conveying, weighing, filling, and packaging automation systems in food processing applications of all kinds. We have conveyed and packaged hundreds of major and minor ingredients such as; flour, bakery mixes, potato flakes, pretzels, candies, whole coffee beans and ground coffee, biscuit mix , apple fibers, brown sugar, confectionary sugar, granular sugar, cheese shreds, frozen shrimp, steamed oats, cereals, trail mix, muscles and more. Our quality hand crafted equipment provides the day in and day out reliability, flexibility, clean out and efficiency your plant needs when keeping your conveying and packaging lines moving. From stainless product contact parts to 3A dairy Magnum Systems provides equipment to meet your application requirements. Below are some examples of conveying and packaging systems we have provided for various applications in the food industry. Dilute phase pressure systems conveying sugar and powdered milk for filling bulk bags. 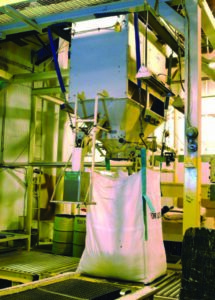 Gravity net weigh scale systems for filling bags from 25 pounds to two tons in peanut processing. Solution Overview – Customer needed to receive premium ingredients for beer manufacture by rail for economies of scale but did not have a rail siding at the plant. 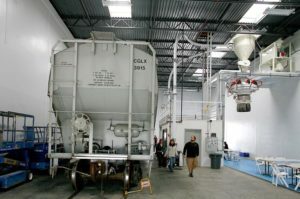 Magnum Systems provided equipment to vacuum unload the material at low velocities to avoid bruising or degradation and transfer the equipment into trucks for delivery at the plant. The material was vacuum unloaded from the cars by means of an adapter so that the use of pits were avoided and transferred to filter receivers on a support stand, where the material was gravity discharged into PD trucks via dustless loadout spouts for a clean and sanitary environment. 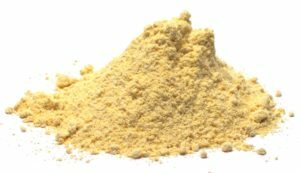 Project Scope – The customer needed to fill corn meal into extra tall bulk bags. The system needed to accommodate these bags and allow removal of the bags on-a-pallet and with the use of a hand truck. Current systems caused problems with the platform scale design being hard to clean and weight inaccuracies. Magnum Systems recommended an IBC 3000 Bulk Bag fill station with a modified “traveling” weigh carriage design. Solution Overview – The customer liked the idea of our suspended-weigh and fill design with the load cells at the top of the framework, away from damage by forklift contact and no floor scale to clean under or move the hand truck up onto. In order to allow the long bags to be installed without the operator needing a ladder, Magnum Systems made the upper weigh carriage, bag-strap hangers and neck seal movable, and it lowers to easily and ergonomically allow the operator to install the empty bag, and then rises to fill to weight. Project Scope – Upgrade existing weigh feeding scales from outdated technology. Some of the issues consisted of changing target weights on old beam scale which slowed down production when switching between container sizes ranging from 25 lb bags to 2,200 lb bulk boxes. Limited programming and process visibility for current run, no indexing or saving of previous completed runs, and manual quality samples had to be taken which required the operators to stop production, take a sample then re-start the filling process which also slowed overall production capabilities. Solution Overview – Magnum Systems provided upgraded net-weigh filling scales with PLC controls to increase production. Simple control calibration between target weights, automatic product samples and centralized controls to monitor process, runs completed, container types filled, samples taken, individual weight of each container, number of rejects, and lot run start stop times, significantly improved the packaging process.